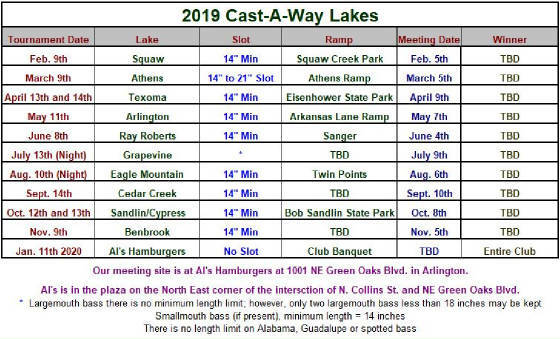 Castaway Bass Club is based out of Arlington, Texas and is a family friendly yet competitive bass club that believes in growing the sport of bass fishing. Whether your a novice or experienced angler, you can find what your looking for in Castaway! We are ready for another season of Cast-A-Way fishing. Optional meeting for Squaw Creek will be Tuesday the 5th at 7:00pm at Al's Hamburgers at Green Oaks and Collins in Arlington. All tournaments are open to the public and membership and tournament dues can be paid at the ramp on the morning of the tournament.